Click darker text for map locations & Warhammer Online links. Greenskins appear. Exactly when and how they manifest is a topic of some debate, but the "Old Ones" (god-like beings) recognized the threat and send the Saurus (Lizardmen) to war with them. The Saurus are unable to completely exterminate the "undesirable" race. The "Old Ones" disappear from the world for unknown reasons. The Dwarfs build settlements in the Worlds Edge Mountains which stretch along the eastern edge of the Old World. Foundation of first Elven colonies in New World. Malekith defeats Orc warlord Gritok Redfang and saves city of Athel Toralien. The Slann (powerfully adept magic users, custodians of the Old Ones, and rulers of the Lizardmen) shift the world's plates in accordance with the Old One's "plans". The resulting earthquakes and volcanic eruptions plague the Dwarf empire opening the door for Orcs, Goblins, Skaven, Trolls, and Ogres to run rampant over the lands. Dwarfs and Goblins struggle for control of the Dwarf empire. The time of the "Goblin Wars" has begun and will rage on for the next 500 years. Karak Ungor is the first of the Dwarf strongholds to fall to the Greenskin hordes. The conquering Night Goblin tribe known as the "Red Eyes" occupy the upper levels and fight many years with the Skaven (Ratmen) for control of the lower reaches. The area is known from this point forward as "Red Eye Mountain". Karak Varn is the second of the Strongholds which overlook the Black Water to fall to the Skaven and Night Goblins. In their lust to mine Gromril (special iron used by Dwarfs to forge legendary weapons and armor) the Dwarfs had mined so deep into the interior of the mountain that they reached the underground water of the nearby lake destabilizing the ground and structures above. Flooding in the mine tunnels washed away thousands of Dwarfs and untold riches in treasure. The Skaven and Goblin used the tunnels to infiltrate the city and drive away it's former Dwarf inhabitants, not for the Gromril iron, but for the warpstone (solidified Dark magic/ Chaos Energy which holds transmutation and alchemical powers) also found in the mine. The city soon became polluted with the taint of the warpstone and no Dwarf would willingly live there. The Dragonback Dwarfs are defeated by Orc Warlord Argor Foespike and the Ekrund and it's mines are taken by his Boyz. Galleys from Barak Varr control the Black Gulf and repel further Orc attacks. The watchtowers of Mad Dog Pass are all either abandoned or fall to the Greenskins. The Brightstone (rare metal used by the Dwarfs to forge "Doomstriker" weapons) mines beneath Mount Gunbad |PvE| in the Badlands are taken by the Night Goblins. Mad Dog Pass is also taken by the Greenskins. The Silver Road Wars begin. The Silver Road is a central route bypassing the northern face of Dwarf capital city Karaz-a-Karak and leading west into Black Fire Pass. The Dwarf stronghold of Mount Silverpine is taken by the Orc Warlord Urk Grimfang, renaming it Mount Grimfang marking the end of the Silver Road Wars. Dwarf King Morgrim Blackbeard's army pushes the Orcs out of the World's Edge Mountains to the north of Mad Dog Pass. Mount Gunbad is temporarily recaptured by the Dwarfs, but they are unable to hold the area when Orc reinforcements arrive. Mount Grimfang is attacked, but Orc Chieftain Nurk Ard'ed repels them until the Dwarf army is compelled to return westward as a horde of Trolls and Ogres moves towards Karaz-a-Karak. 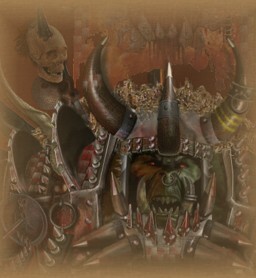 The Necromantic Mourkain Empire, under the direction of Kadon, expands in size resulting in many Greenskins being driven out of their settlement in the Badlands. Dork Redeye unites the tribes of Orcs into a massive Waaagh! and marches upon the city of Morgheim. 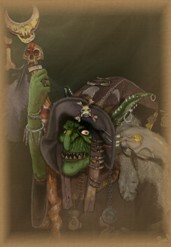 Despite being well-schooled in the Necromantic arts, Kadon's people were no match for the amassed might of the fearsome Greenskins and were slaughtered wholesale. The city is pillaged and burned to the ground. Kadon is killed by Dork. Runesmith Kadrin Redmane leads an expedition which retakes Karak Varn expelling the Greenskins and driving the Skaven down into the deepest Underhalls. Dwarf mine the rich vein of gromril discovered by Redmane. Karak Hirn established in the Black Mountains. Dwarf Runesmith Redmane is ambushed besides the shore of Black Water and killed by Orcs while leading a mule train of Gromril ore. Kadrin slays thirty-six massive Orcs before he sustains a mortal wound and falls. His last act is to throw his hammer far out into the Black Water to prevent it from falling into the hands of the enemy. After Kadrin�s death, the Dwarf�s hold on Karak Varn becomes increasingly tenuous, until Orcs and Skaven force the Dwarfs out and overtake the hold. Karak Norn is established in the Grey Mountains above Loren Forest. Battle of the Glade of Woe. An Orc and Goblin army is wiped out by Wood Elf forces while invading the Karak Varn becomes increasingly tenuous, until Orcs and Skaven force the Dwarfs out and overtake the hold. Loren Forest. Red Cloud Goblin tribe attack on Karak Vlag fails. Karak Azgal is attacked by Goblins, but the siege is turned back. They go on to attack and partially occupy Karak Azul. After ten years of hard fighting they are forced out by the Dwarfs. The Battle of a Thousand Woes in which Dwarf King Skorri Morgrim attempts to recapture Redeye Mountain (Karak Ungor) is somewhat successful, but an ambush at the entrance to the keep thwarts the kings plans and he is forced to return to Karaz-a-Karak. King Alkharad wages war against the Greenskins in what will become known as the War of Bones. Nearly 100 years of war results in the fall of Karak Eight Peaks to the Greenskins and Skaven. The prevailing armies continue to battle among themselves for control of the depths. Orc Warlord Dork Redeye leads a huge army of Greenskins who destroy the Dwarf hold of Karak Azgal and then move on to take Karak Drazh, renaming it the Black Crag . Lands between Mad Dog Pass and Fire Mountain taken over by Goblins save for Dwarf stronghold of Karak Azul which remains under constant siege. Orc Warlord Ugrok Beard Burner leads a Waaagh! north to the Dwarf capitol city of Karaz-a-Karak. The Dwarf High King Logan Proudbeard is captured and humiliated by the Orcs, but the Greenskins are finally driven from the capitol by armies under the command of Gorazin Silverhorn. The Orc armies are eventually defeated at the Battle of Black Water where Dwarf cannons are used for first time. Human armies from southern Old World defeat Orc tribes along the Badlands coast of the Black Gulf. -15 Dwarf trading convoy from Karaz-a-Karak ambushed on its way to the Grey Mountains. King Kurgan Ironbeard captured by Orcs and rescued by Sigmar. In gratitude for his rescue, Kugan gives Sigmar the rune hammer Ghal-maraz as a gift. Human armies under Sigmar, and and Dwarf armies under King Kurgan combine to defeat a massive Greenskin army at the Battle of Black Fire Pass . in recognition of their great victory, Kurgan ordered his Master Runesmith to forge the Runefangs. A century in the making, the Runefangs were gifted to each of the Empire's Elector Counts. Several campaigns to retake strongholds are launched, but all fail. 475-491 Orc horde invades Tilea, many cities sacked. Tileans begin efforts to drive the Orcs back over Apuccini Mountains. Great incursion of Greenskins from the Grey Mountains. The Orc Warlords demand tribute from the Bretonni tribes but their demands are rejected. Expected support from Tilea doesn't come. For the next 400 years the Bretonni fight against the Orcs. Bretonni duke Giles le Breton unites the chieftains of the Bretonni tribes under a banner blessed by the "Lady of the Lake" driving the Greenskins back across the Grey Mountains and solidifies the realm of Bretonnia. Orcs are finally driven out of Tilean lands. Guillaume Barbenoire, the third Bretonnian king, defeats a large Orc army at the Battle of Armandur and drives out the last of the Orcs from northern Bretonnia. Host of Knights Errant battle Orcs and Goblins at the crossings of Blood River. Bretonnian knights build castles to hold back Orcs. Orc Warlord Gorbad Ironclaw (by many accounts, the mightiest Orc Warlord who ever lived) defeats Crusher Zogoth and succeeds in uniting the Iron Claw and Broken Tooth Greenskin tribes at the fortress of Iron Rock. The Waaagh! takes Karak Azgal and then move on to take Black Crag. Gorbad leads his army into the Empire leaving a path of destruction in his wake. Great cites are burned and sacked. Many lives are lost. The count of Sollard is slain and his Runefang is taken by Gorbad's army. It is eventually retrieved (after a great many attempts)and is now carried by Kurt Helborg. Gorbad is seriously wounded during the Battle of Grunberg at the hand of the Count of Wissenburg, who was himself badly wounded in the fight, but the Greenskin army prevailed. The Empire army is forced to retreat to Altdorf. The Greenskin Waaagh! moved on to lays siege at Altdorf and the Emperor Sigismund is killed in battle, but Gorbad's wound slowly causes him to grow weaker and weaker until the Waaagh! eventually breaks down. The eastern portion of the Empire lay in ruin. The remnants of Gorbad's tribe are ambushed and defeated on their way home by a Dwarf army. Gorbad's ultimate fate is unknown. Remnants of Gorbads army make their way over the Grey Mountains, and are summarily slaughtered by Bretonnian knights. The Goblin hold, later known as Gnashrak's Lair, is attacked by a Chaos horde led by the Khornate champion Kastagrar. Every single Goblin is wiped out, and Kastagrar is elevated to Daemonhood for his actions. King Louen Orc Slayer begins the Errantry Wars and declares his intention to rid Brittonia of the Orc invaders. Over the next century he makes good on his promise and the territory is once again cleared of Greenskins. Orcs chased out of Bretonnia during Errantry Wars are ambushed by Wood Elves. The Battle of Black Falls between the Dwarfs and Goblins on the shores of the Black Water results in the death of both the Dwarf High King Alrik and the Goblin Warlord Gorkil Eyegouger. The Goblin army is eventually defeated. Imperial Dwarfs learn of corruption of eastern kin (the Chaos Dwarfs). *note- The Chaos Dwarfs are directly responsible for the creation of the much larger and somewhat smarter "Black Orcs" for use as slaves. The Black Orcs are found to be too difficult to control and are driven from the Chaos Dwarf lands. The Great War. 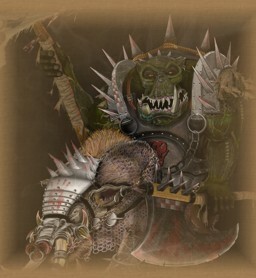 Many Greenskins fight alongside the forces of Chaos, others attack Chaos warbands as they pass into the Empire. Margraf Frederik wages war with the Iron Claw tribe at the edge of the Border Princes. After years of fighting the Iron Claws are soundly beaten and retreat to the hills. The Battle of Rutgarburg. Forces led by Rutgar defeat the remnants of the Iron Claw tribe, from which they do not recover. Siege of Monte Castelo, five hundred mercenaries hold out against ten thousand Orcs. Disappearance of Matthias IV. Grom the Paunch of the Misty Mountain rises to power. He is an extremely obese and fierce Goblin Warlord who, according to legend, once ate a plate of raw troll meat giving him an almost troll-like ability to resist injury. He wields a battle axe named Elf-Biter and is accompanied at all times by his tiny assistant Niblit. Grom gathers the various tribes of Mad Dog Pass and brings destruction on many Dwarf tombs, mines, and small settlements. His hordes defeats a Dwarf army at the Battle of Iron Gate. The Waaagh! moves into the Empire and burns Nuln to the ground. He rampages throughout the Empire for 4 years and then inexplicably moves to the sea and builds a fleet. A great storm blows the ships westward and Grom ends up in the Elf realm of Ulthuan . The Waaagh! continues in the land of the Elves until he is finally defeated by an army led by the Elven hero Eltharion at Tor Yvresse. Grom's fate is uncertain. During this time, the Brettonian King Charlen renews the Errantry Wars in the east and wins a huge battle against the remaining Greenskins at Blood River. The Goblin Warlord Boggrub Legbiter leads the Broken Nose tribe against the Dwarfs of Karak Azul and captures from them two war machines. The name the siege weapons Skull Crusher (trebuchet) and Lead Belcher (mutli-cannon). Using these weapons they lay a path of destruction through the Worlds Edge Mountains and into Averland. Battle of the Jaws. Belegar declares himself King of Karak Eight Peaks. His armies descend into the Keep, but become tangled in a bitter and long lasting battle with the resident Greenskins. A Dwarf army commanded by Duregar is sent to reinforce Karak Eight Peaks. They scatter the orc armies and move south where they are ambushed by Goblin Warlord Skarsnik at the Battle of East Gate. The Dwarf army fights its way through to the stronghold with heavy losses. The hold remains in Dwarf hands, but is in a constant state of siege from Skarsnik and his Crooked Moon Goblin tribe. Skarsnik does not capture the city itself, but awaits outside for anyone foolish enough to venture beyond the giant walls and doors. The screams of his surviving enemies being tortured echo just outside of the city. Gorfang Rotgut was present at this battle and lost his eye in the fighting. Skarsnik launches attacks against Barak Varr , Karak Azul and throughout the Badlands. Goblin activity along Worlds Edge Mountains increases rapidly. Dolgans unite under War Chief Darok Hookhorn and declare war on all Goblinoids. Morglum Necksnapper is the leader of the mighty Necksnapper tribe of Black Orcs from the Dark Lands. In 2488 he and his second-in-command, Oglok da 'Orrible, lead theGreenskin force across the World's Edge Mountains and defeats a large Bretonnian errantry army which had been methodically cleansing the northern Badlands of Greenskins for several years. As the Bretonnian Duke and his surviving knights galloped frantically out of Death Pass towards the setting sun, pursued by hordes of Goblin Wolf Riders, Morglum Necksnapper made his famous pronouncement "Let 'em tell da King. Da east belongs to da Orcs. Da east belongs to Morglum. Da east is green". Morglum rides a boar into battle. So well trained is it that he can use both hands to wield axes rather than needing one to rein it in. He wears "Bulak's Bloody Armour" which is tainted with orc blood (Bulaks mostly) that will not wash off. It is rumored that the spirit of the Bulak is part of it, eager for revenge. "The only good stunty is a dead stunty; and the only thing better than a dead stunty is a dyin' stunty wo tells yer where to find 'is mates." The Bretonnian king declares the Errantry Was at an end after this crushing defeat. Orc Warlord Gnashrak forms a massive WAAAGH!, uniting all of the Greenskin tribes of the World's Edge Mountains, and marches his army along the Silver Road toward Karaz-a-Karak. They rampage through the mountains for years, threatening to capture the Dwarf capital. Wurrzag Ud Ura Zahubu, a low status Savage Orc of the Bone Nose tribe, is expelled from the tribe by the shaman Wizzbang out of jealousy when he starts to develop shamanistic powers. Orc Gorfang Rotgut is now chieftain of the Orcs of Black Crag known as the Red Fangs. Gorfang has subjugated most of the local Orc tribes but his neighbors are the Night Goblins of Karak Eight Peaks whose leader is the old and infamously cunning Skarsnik. The two leaders enjoy an uneasy alliance, with Skarsnik controlling the mountains around Karak Eight Peaks and the eastern end of Death Pass, while Gorfang controls the western end of Death Pass and the adjoining area. Gorfang attacks Barak Varr and later joins up with Orc and Goblin tribes under the command of Morglum Necksnapper. The two orc armies launch a surprise attack on Karak Azul entering the stronghold via long forgotten tunnels. King Kazador's family is caught defenseless in the throne room and many of the Dwarf Lord's kinsfolk are captured. Some were taken back to the dungeons of Karak Azgal where they currently remain. The Dwarf Lord's son, Kazrik, was not taken captive but was shaved, and his head tattooed with a crude Orc glyph representing Gorfang. He was then nailed to Kazador's own throne. Although Kazrik survived, the experience has unhinged him somewhat. Lord Kazador has sworn vengeance and awaits the day when he can crush the Orc chieftain. Fighting in the Barak Varr area remains heavy. Wurrzag Ud Ura Zahubu, now a Savage Orc Great Shaman, returns to the Bone Nose tribe where he smites the shaman Wizzbang who expelled him from the tribe and transforms him into a Squig. Wurrzag then leaves, saying he's off to find the famously mythical Once and Future Git who will unite the Orcs. Some of the tribe follow him. Among those that remain with Warboss Gablag Nosebreaker, a Savage Orc named Wooshum who develops shaman powers and takes over as shaman of the tribe. Gnashrak is defeated by King Ungrim Ironfist of Karak Kadrin at the Battle of Broken Leg Gulley. An army of Goblins lead by Night Goblin Warboss Spinny Backstab destroys over 100 farms and villages surrounding Middenhiem in the Empire. Backstab is eventually defeated by Middenmarshal Kurt Heinwald aided by a steam tank dispatched from Nuln. Goblin Boss Gorblum Yellowstreak cons an enchanted crown from an Orc shaman and renames himself "Gorblum the Magnificent". He uses the crowns power of command to gather an army and attacks the village Eisenhof after having attacked two Dwarf mines. Clan leader Thorgrim Greybeard gathers his forces and attacks this army. The Dwarf forces are annihilated. Thorgrim escapes. Azhag the Slaughterer, chieftain of a small Orc tribe from the Troll Country, is attacked by marauding Chaos warbands on the edge of the northern wastes. The tribe is forced into the ruins of Todtheim. A Chaos Troll crept up on the tired Orc band and slaughtered each and every one of them save Azhag himself who had proved the beast's match and chased the monster back to its lair where he slaughters the beast and finds the Crown of Nagash in it's treasure hoard. Using the power of the crown he gathers a huge Greenskin army and leads them into the northern Empire burning and pillaging vast swathes of land. Azhag rides to battle on the back of a large Wyvern often harrying his retreating enemies from the air after the battle. Azhag the Slaughterer was killed in combat with Seneschal Kessler of the Knights Panther. His crown, which gave him shamanistic powers as well as nightmarish visions, was taken to Altdorf and sealed in the Imperial vaults, where it remains to the present day. The Third Battle of Black Fire Pass. Orc horde commanded by Orc Warlord Vorgaz Ironjaw tries to invade the Empire. Elector Count of Averland Marius Leitdorf "Mad Lord of Averland" is killed with the Averland�s Greatsword (Landsknects), when completely surrounded by the huge tide of Greenskins. The battle lasts long enough to give Reiksguard Knights, lead by Emperor Karl Franz, time to arrive before the Greenskins are able to regroup and the Orc army is smashed. Dwarf warriors attempt to reclaim the Ekrund Fortress |RvR SCENARIO| as an outpost to guard against the "great Waaagh!" spearheaded by the Orcs of the Bloody Sun Boyz at nearby Mount Bloodhorn. 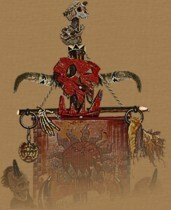 It is believed that the Warhammer lore splits around this time dividing into the "Storm of Chaos" and "Age of Reckoning". It is not currently officially know exactly where the alternative timeline begins. Some characters introduced in the "Storm of Chaos" storyline may indeed be seen in the MMO, but the storyline functions of the MMO may not be the same.